The 1.2 million Rotarians who make up more than 35,000 Rotary clubs in nearly every country in the world share a dedication to the idea of Service Above Self. Rotary clubs are open to people of all cultures and ethnicities and are not affiliated with any political or religious organizations. 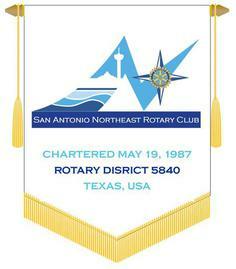 The San Antonio Northeast Rotary Club has been serving our community since 1987. For the third week in a row we had the pleasure of inducting a new club member. At our April 2nd meeting, Caroline Caldwell, left, was inducted as the newest member of the San Antonio Northeast Rotary Club. Club president Patsy Esterline presented Caroline her new member packet. Carlos Martinez spoke to us on Tuesday, April 16th about the Texas Cavaliers organization and the upcoming River Parade. Club president Patsy Esterline posed for a photo with Carlos Martinez after his presentation. Carlos passed out some special Texas Cavaliers Fiesta Medals.